Organization-Origin of Name-William B. Clymer-His Generous Treatment of Settlers-Physical Features of Township-Forest Growth-Streams-Area-Early Settlers-Early Industries-Schools and Justices-Churches and Cemeteries-Societies-Villages and Post Offices. Clymer township, originally named Middletown, was formed from portions of Westfield and Gaines townships in December, 1850, and was named in honor of William B. Clymer, a grandson of George Clymer, a distinguished Pennsylvanian and one of the signers of the Declaration of Independence. Mr. Clymer was the agent of the Bingham estate, to which, before its settlement, nearly all the land in the township belonged. Land was sold at $1.25 per acre, and Mr. Clymer did much to encourage settlers to locate in the township, and many stories are told of his generosity toward those who, through failure of crops, sickness or other causes, not due to their own shiftlessness or lack of industry, were unable to meet their payments. In many instances he extended them time, loaned them money refusing interest therefore, and did his best to put heart into them and encourage them to remain on their clearings and make their permanent home in the township. Many of the old settlers, who afterwards became prosperous and well-to-do farmers freely admitted that, had it not been for his generous aid and encouragement, they would have abandon their clearings and begin anew elsewhere. The general elevation of this township is about 1,600 feet above the sea level. It forms a part of the watershed of northern Pennsylvania, the streams in the northern half flowing north into Cowanesque river, and those in the southern part flowing south into Pine creek, a tributary of the West Branch of the Susquehanna river. The surface of the land is rolling and hilly, but not enough so to interfere with cultivation, except to a very limited extent. The township is therefore a good agricultural township, and abounds in well-tilled and productive farms. Unlike most of the other townships of the county, the timber growth at the time of its settlement was mostly hard wood, principally maple and beech, with a liberal admixture of hickory, cherry ,and hemlock. The lands were not, therefore, purchased, in the first instance, with a view to lumbering, but to cultivation. The streams of the township are Potter brook, which rises in the northwestern part, and flows north into Westfield township, uniting with the Cowanesque river at the village of Potter Brook ; Crance brook, which rises in the southern part of the township and flows north into Westfield township; Mill creek and its branches which drain the central part of the township, flow north into Westfield township and unite with the Cowanesque at Westfield borough. Jemison creek, which has its source in the southeastern part of the township and flows north into Westfield township, empting into the Cowanesque at Phillips Station; and Long run and its branches, which drains the southwestern quarter of the township, and flows south into Gaines township and unites with Pine creek. The township is nearly square, being seven miles from east to west by about five and one-third miles from north to south, the superficial area being about thirty-seven miles. James Mix, who located at what is still known as Mixtown in 1818, is reputed to have been the first settler in the township. In 1820 Simon Rixford, a Revolutionary soldier, and a pioneer settler at Knoxville, purchased the Mix property. He was accompanied by his wife and his stepson, George O. Bristol. The latter assisted him in clearing his land and later purchased a tract for himself from Mr. Rixford’s son David. At this time the entire township was a wilderness, the nearest neighbor being Stephen Potter, at the mouth Potter brook, in Westfield township. In 1823 Rufus Scott, a son of Luke Scott, a pioneer settler at Knoxville, located west of Rixford on the place now owned and occupied by his son, Eli D. Scott. George Briggs, another early settler, came about 1823, and settled east of Mixtown. Christopher Schoonover also settled about 1823 in the Mixtown neighborhood. Silas S. Griffin, a native of Madison county, New York, settled, in 1833, in the eastern part of the township, on the farm now occupied by Charles L. Bruce, who married his widow. Peter Rushmore, a native of New York, and a tanner and currier, settled in Knoxville in 1820 and in 1835 removed to and cleared and improved the farm now occupied by Wilbur Churchill, passing his life there. In 1836 Lyman Hancock, a native of Madison county, New York, settled near Sabinsville, where he resided until 1868,when he removed to Westfield. In the same year Isaac Beach located in the Mixtown neighborhood on a farm now occupied by his son, Burdett Beach. Charles P. Douglas, also a native of Madison county , New York, located in February 1837, near Sabinsville.In 1837, also Orrin Stebbins settled in the Sabinsville neighborhood. Alonzo Giles Sabin, a native of Lebanon, New York, settled in 1838, on the farm southwest of Sabinsville now occupied by his widow and his son, Luman E. Sabins. The village of Sabinsville was named in his honor. In 1840 Freeman Wilcox, a native of New York, settled on and improved the farm west of Sabinsville now occupied by his son, William W. Dixon Southworth settled in 1842, in the northeastern part of the township, on a the farm now owned by his son Charles. He died in February,1893, aged eighty-nine years. Erastus G. Hill located in the township in 1844, and afterwards removed to Westfield and built the Hill House. In 1845 Thomas Barber settled in the Mixtown neighborhood. Aaron Yale, one of the oldest living settlers of the township, located in 1845 a shirt distance southeast of Sabinsville. In 1847 Thomas Eldridge, a native of Vermont, settled on the farm southeast of Sabinsville now owned by his son, John Eldridge. In this year, also, Reese I., Reuben and Hiram Reynolds settled on Jemison creek. In 1848 Sylvester Davey , a native of Chenango county, New York, settled south of Sabinsville, in what was then Gaines township. In the same year Roswell Ackley settled in the Ackley school district, northeast of Sabinsville. His son, C.C. Ackley, now occupies the old homestead. E.G. Smith settled between Sabinsville and Mixtown in 1849 in which year John Sawyer came into the township. In 1849, also, Dennis D. Robert, a native of Herkimer county, New York, settled near Sabinsville, and divided his time between farming and his trade. Besides those mentioned, the following were early settlers in the township; John King, Elihu Matteson, Willard Potter, Archibald Campbell, Samuel Swimelar , Orson Pemberton, Nathaniel Owens, Watson Trowbridge, who settled about 1839 or 1840; Nathaniel Skinner, William Larrison, Samuel Niver, C.R. Skinner, Caleb Trowbridge, Peter Lovell and John Lovell, all of whom settled in and around Mixtown. Among the early settlers on Long run were George Harvey, Jared Davis, who located on the site of Davis Station; Calvin Newton, Moses Newton and William R. Burdic. Among those who settled in and around Sabinsville were Thomas Strait, Zachariah Heminger, William Rogers, Roswell Rogers, Demarquis Thompson, Frederick Swimelar, William Ladd, Lovel Short, Cyrus Paddock and George, William and Charles Labar. Before the forest were cleared away and the township reduced to its present high state of cultivation, nearly every settler had a “sugar bush,” of from one to several hundred sugar maple trees upon his place, and the approach of spring was heralded by the lighting of the fires in hundreds of “sugar camps,” and the manufacture , during the sap-running season, of large quantities of maple sugar, which was hauled overland to the Cowanesque river and to Pine creek, and shipped on rafts down those streams, finding a ready market in Painted Post, Corning, Elmira, Towanda, Williamsport, Harrisburg, and Philadelphia. The sugar camp was not only a scene of industry but of merry making, of which the young people took the fullest and freest advantage, and many a gray-haired sire and matron loves now to recall the frolics and dances that accompanied this pleasant and well-neig departed occupation of each returning springtime. Though not the leading industry, lumbering was carried on to a considerable extent, and mills for the purpose of home supply were erected on Mill creek and its branches, the lumber manufactured being used in the erection of houses and barns, though most of the settlers contented themselves for many years with the log cabin, the typical home of the pioneer. In time these were replaced with neat frame residences fit to domicile an industrious and thrifty people. The first school house in the township was built in 1826 at Mixtown. In 1832 a school building was erected at Sabinsville, and as the township became settled new school districts were created, and proper attention paid to the education of the young. The school at Sabinsville is now a graded school, in which two teachers are employed. Among the early teachers in this school were Alonzo G. Sabin, Ambrose Close, Martin Purple, Alma Davey and Ann Benn. Other early teachers in the township were Hiram K. Hill, Horace P. Hill, Sarah Whittaker, E.O. Austin, J.B. Seely and Alveron Pritchard. Good schools houses have been erected for the accommodation and comfort of the pupils and good teachers are yearly employed for instructing them in the course of study adopted. The office of justice of the peace has been filled by the following named persons: W.A. Douglas, 1851; re-elected, 1858,1863; James Pritchard, 1853; Daniel Holmes, 1861;V.R. Gee, 1868; re-elected, 1873,1878; Ira S. Stocum, 1873; re-elected, 1878,1883,1888,1893; J.L. Thompson, 1882; re-elected, 1887,1896; Alfred King, 1892; John Davis, 1893. The Methodist Episcopal Church of Clymer was organized about 1853, and a house of worship erected in 1856 at a cost of $1,100. It was dedicated December 17,1859.A new church edifice was erected in 1888, and dedicated December 18, of that year. This was destroyed by fire December 9, 1893. This church being in the Westfield charge, the same pastors have served both societies. Since the burning of the church building, however, the organization has lapsed. Some of its members have united with other churches, while others attend the church in Westfield. Clymer Baptist Church was organized in March,1869, in the Methodist church in the Ackley school district, about a mile east of Sabinsville, by Rev. William Owens, evangelist. Among the early members were O.B. Colony, Barton Morse and wife, Mrs. Martha Reynolds, Mrs. Estoria Frasier, Mrs. S.J. Ackley, Noah Weeks and wife, Asa Gile and wife and Mrs. Betsey Davis. 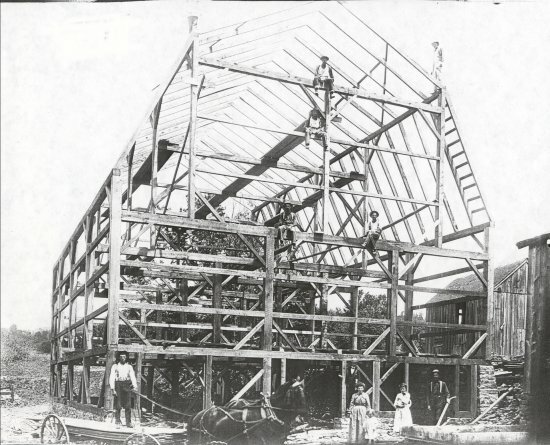 In 1871 the congregation began the erection of a house in Sabinsville. It was completed and dedicated in 1877. It is a neat frame edifice and cost $ 3,000. The first deacons of this church were O.B. Colony, Willard Brown and L.H. Knapp. The following named ministers have served this church as pastors: Revs. Orson Schoonover, Martin Seagers, Mr. Todd, Charles Diffin, P.T. Reynolds, S.L. Bouvier, J. Mullany, A.W. Mettler and S.A. Fields. The church now numbers forty-eight members. There are sixty pupils in the Sunday -school of which Mrs. R.J. Reynolds is superintendent. The Free Will Baptist Church of Sabinsville was organized in June, 1805, with the following members: Mrs. Minnie Ackley, Mrs. Nellie Nichols, Mary Vanloy, S. French, Frank Gill and wife, Daniel Brown and William Cole and wife. This congregation meets in the Baptist church. The pastor is Rev. J.C. Warren, of Keeneyville. Cemeteries-- The Sabinsville cemetery is located in the southern part of the village. It is unincorporated and is a free burial place. The Ackley cemetery is situated southeast of Sabinsville on the Main road to Wellsboro. The Labar burying ground is near Westfield township line on the Mud road. The West Beech Woods cemetery is one and one-half miles south of Sabinsville on the farm of Andrew J. Clark. The Bristol burying ground is two miles west of Sabinsville. In this graveyard lie the remains of Simon Rixford, the patriot and pioneer. The Owen cemetery is situated in the southwest corner of the township, near the Potter county line. The Barber cemetery is at Mixtown. The Larrison and Swimelar cemeteries are practically family burying grounds. In each of these places of burial rest the remains of the early settlers in the immediate neighborhood. Some originally family graveyards have become public cemeteries, while others have been set apart for the private burial of the relatives of the faamily on whose land the first graves were opened. The societies of Clymer are as follows: Sabinsville Lodge, No 2300, K. of H., was organized October 2, 1880, and has fifteen members. Sabinsville Union, No. 253, E.A.U., was organized March 5, 1881, and embraces thirty members. H.C. Ackley Post, No.469, G.A.R., organized January 19, 1885, contains a membership of thirty old soldiers who helped to defend the flag. Sabinsville Grange, No. 989, P. of H., has a membership of sixty-five. It was organized December 15, 1890, and is in a flourishing condition. Clymer Tent, No. 166, K.O.T.M., was organized in 1895. Thus the township is well supplied with social and secret organizations, some of which have done much good in the community. Mixtown named for James Mix, who settled upon the site in 1818, is situated in the western part of the township, about a mile from the Potter county line. At one time it gave promise of being a place of some importance as a trading point. It contains two stores, carried on by W.O. Bristol and J.H. Rushmore, but after the completion of the Fall Brook railroad to Westfield and Potter Brook, and of the Addison and Pennsylvania railroad to Sabinsville, trade was diverted to these places and the stores at Mixtown discontinued business. A post office, established over fifty years ago , was discontinued in October, 1894, for lack of sufficient patronage. Among those who filled the office of post master here were Christopher Schoonover, James Pritchard, W.O. Bristol, J.H. Rushmore and Eli D. Scott. Mr. Scott held the office for seventeen years previous to its discontinuance. A cheese factory, erected in 1886, by J.H. Rushmore, and still owned and operated by him, is the only manufacturing industry in the place. Sabinsville, situated in the Mill Creek valley, on the Addison and Pennsylvania railroad, about a mile south of the north line of the township, was named in honor of Alonzo G. Sabin. The first settlers here were Charles P. Douglas, Orrin Stebbins and Elijah Hancock. A post office was established in 1849, with C.P. Douglas as postmaster. He held the office sixteen years and was succeeded by E.H. Stebbins, who held it twelve years. His successors have been L.J. Stone, G.W. Douglas, who held it for twelve years, and C.M. Davis, who was appointed June 18,1894.The first store in the place was built by Butler B. Strang and stocked with goods by himself and C.P. Douglas. Among the other early merchants were D.A. Tooker, William Simmons, J.L. Thompson and L.J. Stone. Mr. Stone who is still in business, is the oldest resident of the village. Those engaged in merchandising at present are J.F. Goodspeed, F.L. Sears, E.W. Southworth, L.J. Stone, C.M. Davis and E. Bevier. Mr. Bevier deals in hardware and is also in the livery business. George A. Roberts, the village blacksmith, is also a furniture dealer and undertaker. The first hotel was kept by C.P. Douglas. In 1865 D.A. Tooker built the Clymer House. Among those who succeeded him as landlords of this hotel were G.W. Schott, Lucius Inscho and John Eldridge. It was destroyed by fire in 1888, being at the time the property of the last named, who in the same year erected the Hotel Beach, a commodious three-story edifice. The present landlord is Lester W. Rice. In 1837 the first saw-mill in the township was built on Mill creek, within the present village, by Orrin Stebbins and Elijah Hancock. In 1872 Stebbins and Roberts built a steam saw and grist-mill, which was burned in 1877.At the present time a flour and feed mill is owned and operated by E.B. Schott. A cheese factory located in the same building is conducted by O.H. Snyder, of North Fork, Potter county. A shingle mill is carried on by C.B. Cole. The first regular physician in the township was Dr. T.M. Haner. Other early Physicians were Dr. Harvey Leach, Dr. Seamans, Dr. W.R. Francis and Dr. R. Shaw. The profession is represented at present by Dr. T.A. Bair, who came in 1880, and Dr. A.M. Greenfield, who located in 1892. Davis Station or Lansing Post Office, is the name of a railroad station and post office on the Addison and Pennsylvania railroad near the Gaines township line. A store is kept by J.M. Davis, who has been the post office since the establishment of the office in 1868. Azelta is the name of a post office established June 2, 1892,about three miles southeast of Sabinsville. Wilmot H. Abbey has been post master since the opening of the office and also keeps a small store. Clymer is the name of a post office recently established west of Mixtown, near the Potter county line. The post master is Venette Johnson. This office takes the place of the Mixtown office, discontinued in October, 1894.